Look closely at the autographs. 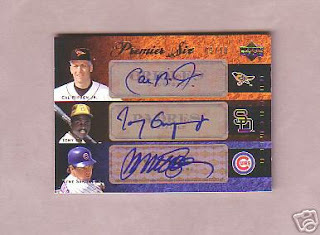 Tony Gwynn Sr., (that's dad) has his son's autograph sticker. 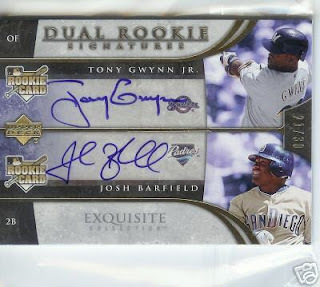 Tony Gwynn Jr., has his dad's auto sticker. If I got the bottom card, which just came out with UD Premier I would be pissed. But seriously, whose job is it to take the stickers off a sheet of paper and make sure it goes with the right person? I get that it’s father and son, but the quality control should be a little better.